One last outfit post from my holiday in Copenhagen. I'm still so in love with clouds (if you've seen my instagram, you'll know), a fascination I suspect will last a lifetime. There's something about their pureness, their varying shapes and texture and the fact that they're surrounded by my favorite colour. I'd become a pilot just to be closer to these magnificent things, but until I become a millionaire, I'll have to be satisfied with having them on my clothes and nails. Take a closer look at my nails here. HOPE YOU ALL HAVE A GREAT W-END! Love the clouds dress and the sandals, you really are gorgeous! 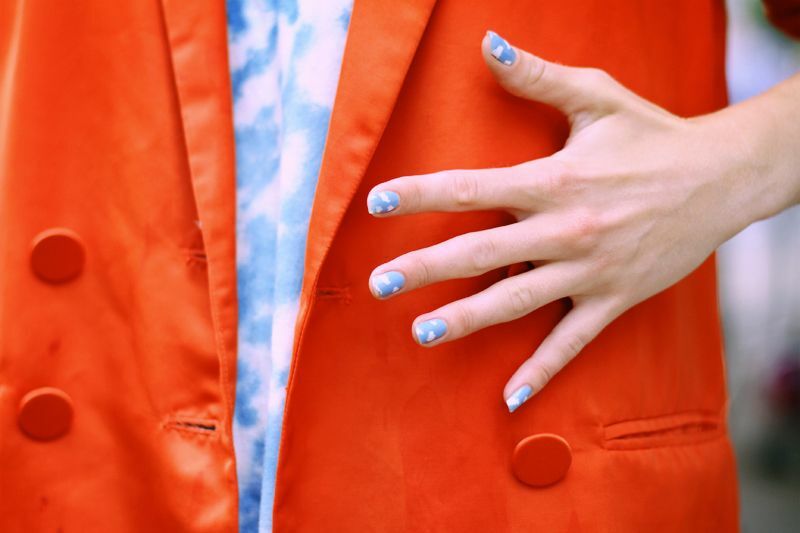 Your nails look so lovely and the colour of the blazer is amazing! This outfit is perfect! The orange and the blue compliment each other so well! So adorable! Love the bright colours! love everything about this, the blazer just completes this outfit! What an original and pretty colour combo! Love it a lot! Perfect outfit! The orange is a great contrast against your dress! Stunning. Sweetie, I feel exactly the same about the clouds and the blue sky. Or the violet sky. Or..
Love the Nails! Such a perfect touch! I'm so in love with this look ! J'adore ta veste, la couleur rend super bien ! Si je la voyais dans un magasin, je ne me serais forcément dirigé vers. j'en vois une dans le même style.